Map showing the boundary of the Camp Fire, the direction the fire burned and the extensive amount of logging and habitat removal that occurred between the fire’s origin and the towns of Paradise, Magalia and Concow which did not stop the fire. Since the Camp Fire burned there has been a lot of discussion in the media and much chest pounding from pro-logging advocates and politicians, including of course President Trump, that if only California would log more of its forests, towns and lives would be saved. Nothing could be further from the truth, and in this blog we discuss the state of the landscape between the Camp Fire’s origin and the towns of Paradise, Magalia and Concow and why chainsaws in the forest do not equal community protection. 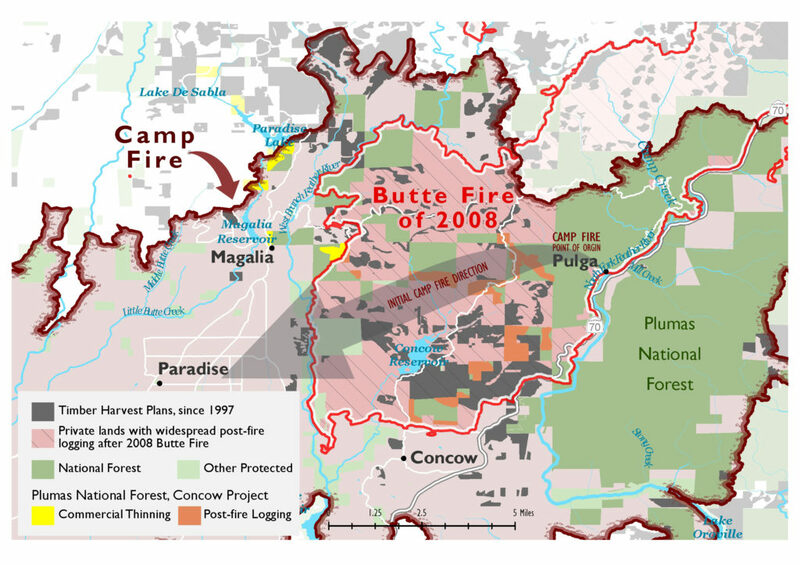 As you can see from the map image above, the area between the origin of the Camp Fire, near Pulga, and the towns of Paradise, Magalia and Concow were heavily logged starting in 1997 and more recently since the Butte Fire of 2008 (the boundaries of which are also on the map). Private lands logging, which typically involves clearcutting or high-grading (removing only the largest trees) has been ongoing in the area for over 20 years. In addition, during the last ten years there have been logging operations that clearcut or removed all of the largest trees that inhabited the Butte Fire footprint. This included cutting down both dead and live trees on both private lands and within the Plumas National Forest. In addition, the Plumas National Forest also conducted a so-called “hazardous fuels reduction” project for the claimed purpose of protecting these towns from fire. This public lands commercial logging project included both the killing of live trees and the cutting of dead trees (upwards of 50% of the trees in any given area were logged) from the forest ecosystem along with extensive removal of native shrub habitat. As we know, from the aftermath of the fire, all of this logging and habitat removal activity did nothing to save homes and lives. The rhetoric and messaging for the last decade which has whipped into a fervor since the deadly fires which burned in California in 2017 and 2018, is that we must remove “fuels” from the forest in order to stop fires. But as the Camp Fire so aptly illustrates, the community did not burn down because of the forest – in fact, many images show homes that are burned to the ground surrounded by live, barely scorched, trees. Below we discuss why the simplistic formulaic reduction less fuels = less fire doesn’t actually work and how logging in our forests can and often does create conditions which exacerbate fire activity. First, “fuel” is a simplistic term which is defined as: a combustible material used to maintain fire. Under this definition anything that can ignite and burn is a “fuel”, including, but not limited to, your home, your car, yourself or your cat as well as any and all organic matter like native vegetation found in a forest ecosystem. But unlike you, your home, car or cat, forest ecosystems are a complex dynamic compilation of organisms from each of the six biological Kingdoms of Life which need mixed-intensity fire to survive. Forest ecosystems cover vast areas of varying landscapes in varying climates with varying compositions of vegetation and interact with fire in ways which are not definable by labeling all vegetation (trees, native shrubs, forbs, flowers, grasses, nuts, seeds, duff and soil) as “fuel”. It is because this term is such an inaccurate measure of a forest ecosystem that the simplistic formula less fuel in a forest = less fire in a forest simply does not apply. Second, study after study has found that fires are overwhelmingly driven by climate, not the composition of vegetation in a forest. Once again this has to do with the fact that forests have been experiencing fires for millennia and are adapted to them. Trees and plants have strategies they can engage to co-exist with fire including thick bark on trees and native shrubs whose oils suppress the growth of easily ignitable grasses. Because the plants, fungi and microbiota in our forests are arranged by Nature in particular ways and have evolved with fire, there are interactions which take place within a forest ecosystem that are very different than what would take place when you put a match to wood in your fireplace. The natural phenomena which can override many of these interactions are wind and temperatures, and this is why they are the dominant forces in determining how large and how intensely a fire burns and not the amount and type of vegetation. Third, Logging disrupts the fire-adapted forest ecosystems which Nature designed in ways which often create conditions which can exacerbate fire activity. Removing standing trees through logging, whether the trees are alive or dead, eliminates natural barriers which can buffer and slow windspeeds. Meaning that the wind can blow a fire faster through an area that has been logged, and can loft embers farther and faster than in an unlogged forest, which is exactly what happened in the Camp Fire. Fourth, logging standing trees, eliminating downed logs and removing native shrub vegetation reduces the amount of moisture in the ecosystem by removing live plants which generate moisture and downed logs which collect and store moisture like a sponge. These activities also expose more of the forest floor to the sun, further reducing moisture in the system through evaporation and increasing on-the-ground temperatures, all of which contribute to conditions which assist in fire spread and growth. Finally, logging removes fire-adapted and in many cases fire-resistant native vegetation and instead brings into the forest easily ignitable invasive species such as cheatgrass and tumbleweeds. Logging also takes harder to ignite standing vegetation and creates thick, homogenous and unnatural layers of organic material (e.g. branches, twigs, needles and ground up wood) on the ground which again is more susuptible to ignition and can more easily carry flames. Logging in forests to protect communities by ostensibly reducing fire risk or stopping fires simply does not work. It did not work in the Camp Fire and it will not save the next town that is in the path of a wildland fire. Those proposing such activities outside the scientifically established 100 foot of defensible space zone surrounding a home as either the entirety or even a part of the solution for community protection from wildfire are putting homes and peoples lives at risk. Let’s learn from the tragedies of the Camp, Woolsey, Thomas and Tubbs fires and implement activities that maintain our forests unlogged and protect our communities. Old growth forests and established ecosystems handle fires and floods much better than land which has been razed. Nature is still so much smarter that we are. We have only a tiny amount of old growth left in the country.